Stan read about La Casa Maria in the San Diego Union-Tribune. There was a coupon in the paper for a discounted lunch or dinner. We decided to have lunch there. Dang, I forgot to get a picture of the outside of the restaurant. 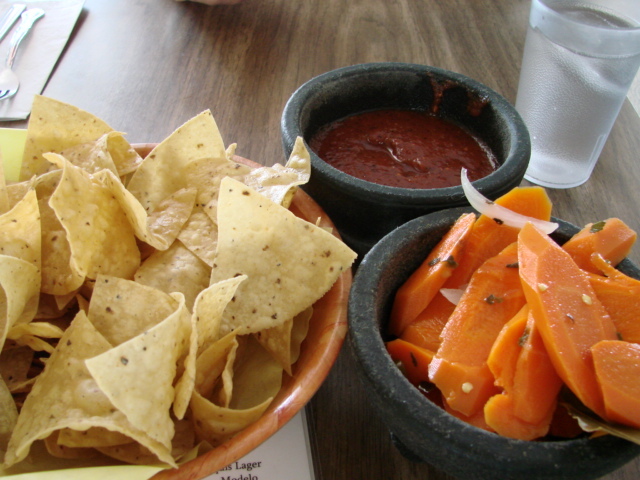 Like all good Mexican food restaurants you are brought a basket of chips and salsa. They go one step further and bring the pickled spicy carrots also. Nice touch. 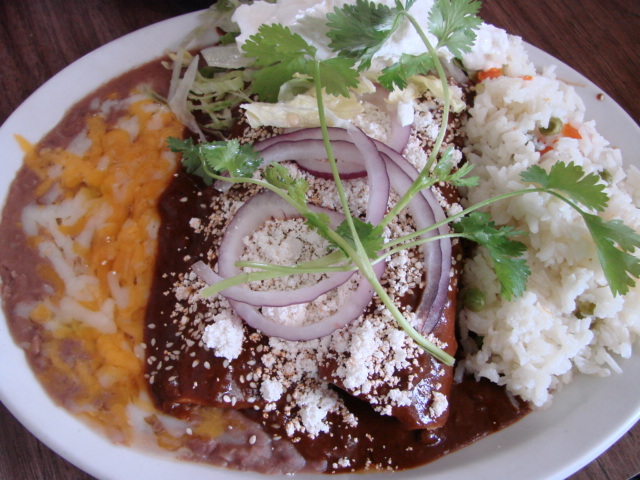 Stan, the mole lover that he is, ordered the Chicken Enchiladas de Mole. It's two corn tortillas filled with chicken, topped with a homemade mole sauce, sour cream, red onion, toasted sesame seed and Cotija cheese. 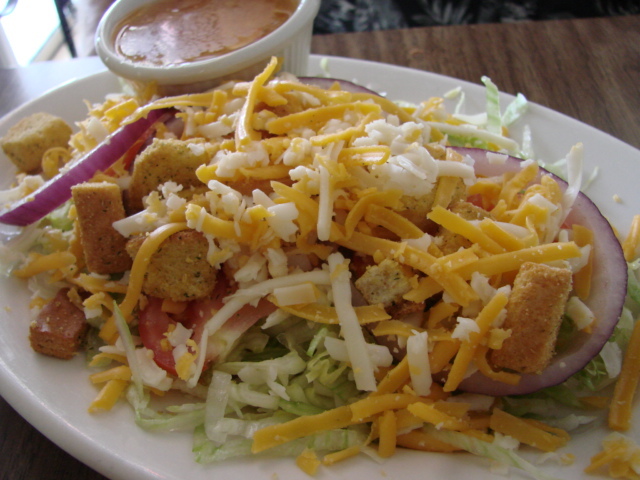 It is served with beans and rice and a choice of soup or salad. He had the salad. 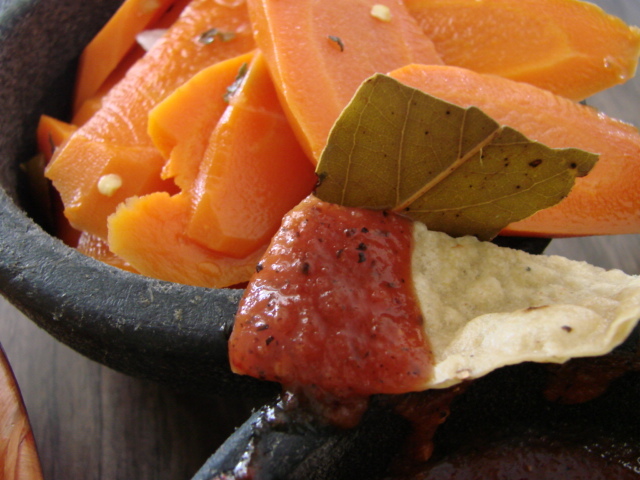 The Mole is a Puebla style mole. Stan liked it very much. He liked it as well as he does the one at Mario's de La Mesa. I prefer this one over Mario's. This is a little sweet with a slight afterburner that runs along the throat. The enchiladas had a lot of chicken in them, they are not stingy with the ingredients. Stan is not a rice eater, he usually orders all beans no rice. This rice was great, almost an Asian style rice with peas and carrots. Stan said it tasted a little sweet to him and he ate all but a few bits of it. I didn't notice any sweetness. 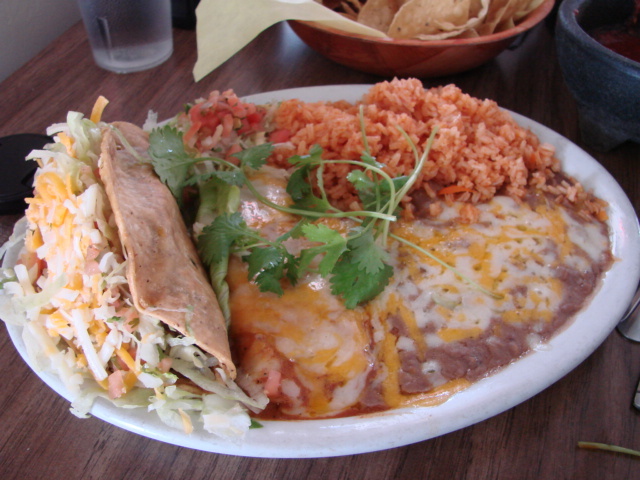 When ever I go to a new Mexican food restaurant I always order a taco and enchilada combination plate. Those are two things I'm really picky about. The taco has to be shredded beef and the shell has to go "crunch" when I bite into it. The shell has to be a real corn tortilla, not a pre-formed abomination or a flour tortilla. Yes, trust me, I've been served those at times. 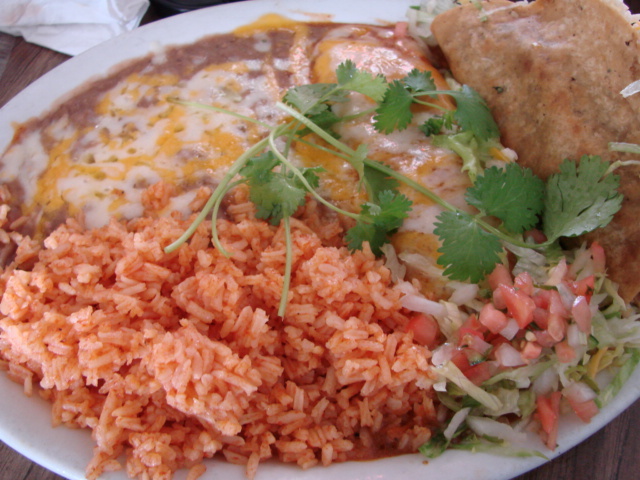 The cheese enchilada should preferably have some diced onion inside with the cheese. There should not be so much cheese that you have a gloppy cheesy mess and not get any corn tortilla flavor with it. The enchilada sauce should be nice and rich and dark with a little kick to it. 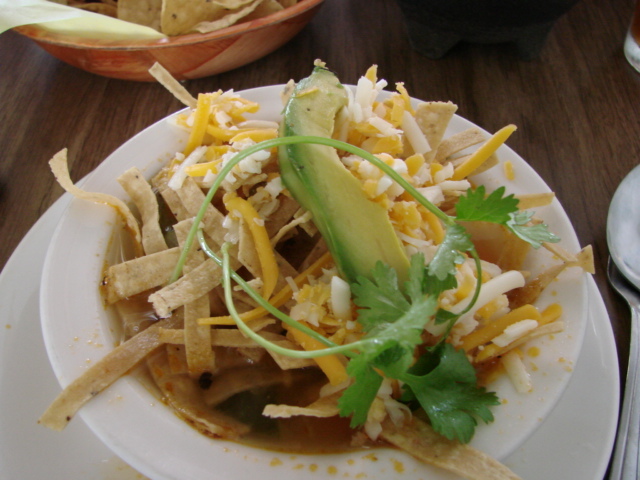 I ordered the tortilla soup with my lunch. 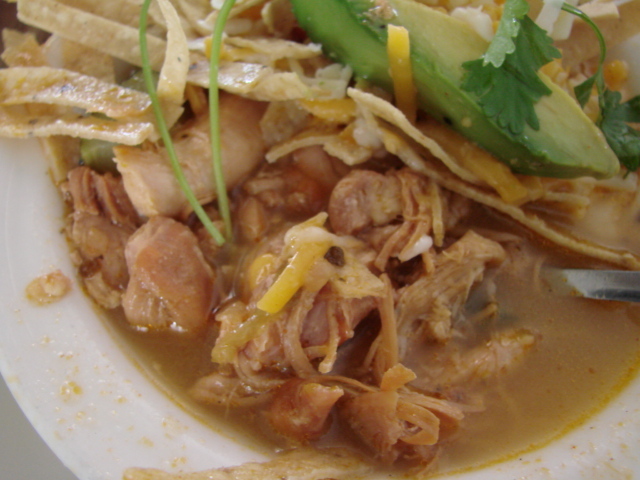 It should have been named tortilla stew, it was full of chicken and vegetables. It could have been a little hotter but it was good anyway. I liked the presentation, it was served with a slice of avocado, cheese, cilantro, fried tortilla strips and a lime wedge. Look at all that chicken. That is from a fresh home cooked chicken. The broth was rich and nicely spiced, not over done but a nice blending of flavors. My combination plate was pretty good. Once I took more than half of the topping off the taco I was able to get a bite of it, and yes, the taco shell was freshly cooked and went "crunch" The shredded beef was flavorful and didn't have bell peppers and onions in the meat that you sometimes get and I don't care for. The taco was placed on a lettuce leaf to help keep it out of the enchilada sauce and keep from getting a soggy bottom, it almost worked. The cheese enchilada was good, not too cheesy and I was able to taste the corn tortilla with the cheese, nice but no onion. The enchilada sauce was good but could have been a little spicier and richer. It is obvious that all the food is freshly made on premises. Here is Enrique Mondragon the owner. I had a chance to talk with him when we were finished with our meal. A very likable man and was most gracious when I gave him my few dislikes about the food. He even said he'd look into the rice when I told him my thoughts on it. He also makes a green mole sauce that sounded wonderful. He asked that we call ahead and let him know when we'll be back and he'll make some for us. He was nice enough to share some ingredients for his moles with me and how he makes his salsa, but I'm not at liberty to say, I promised. 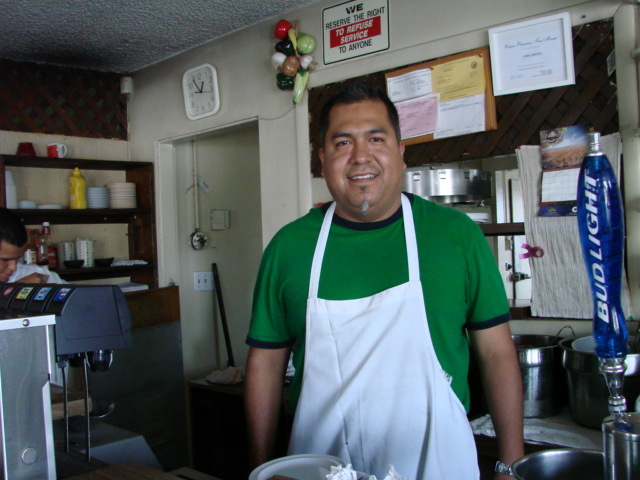 He has worked at El Fandango among other restaurants before saving enough money to buy La Casa Maria. He has a wife and new twin daughters and a son.